Image courtesy: Bryanna's Treasure Box. Rithmomachia is a medieval, chess-like board game for two players, which is based on the number theories of Pythagoras and Boethius. Rithmomachia or "Battle of Numbers" (rithmo – arithmetic, numbers; machia – battle) dates back to about AD 1150 although the earliest publication of the rules was by Jean de Boissiere in the sixteenth century. Used as an educational tool (the only game allowed in medieval schools and universities) and as an intellectual exercise, it enjoyed a last wave of popularity during the Renaissance before the early Scientific Revolution led to its disappearance. 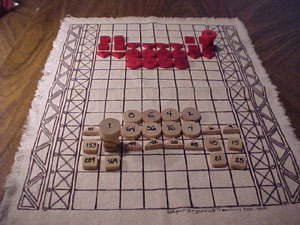 The game is played on an 8 × 16 board. Each player starts with either 24 black or white pieces: 8 circles, 8 triangles, 7 squares, and 1 pseudopyramid. Each of these has a number, which is how many places it can move. A square can move 4 spaces, a triangle 3, a circle 1, and the pyramid as many spaces as the player chooses. Opponent pieces can be captured in a variety of ways: siege capture (surrounding the opponent piece on all four sides; meeting capture (attacking a piece with the same type of piece); assault capture (achieved if the piece's number times the number of spaces it moved lands it next to an opposing piece that equals the product); ambuscade (achieved if two pieces of a player that are on either sides of a piece sum to equal the opponent's piece). There are also a number of different ways to win, including: de corpore (players agree on a number of pieces to be captured); de bonis (players agree on a number value target); de lite (the winner is determined by the sum of the pieces as well as the number of digits on all those pieces); victoria magna (if there is a common difference between the pieces a player has captured, or the squares of three consecutive integers are captured; or there is a difference of 2, 4, and 6 in even pieces, or 3, 5, and 7 in odd pieces.